Solar energy is promoted as a green alternative for the environment, one that harnesses free and bountiful energy from the sun. It comes with the promise of cheaper energy for consumers as well as being an energy source that is free from greenhouse gas emissions and other pollutants. But as critics are quick to point out, that rosy picture isn’t entirely true. Solar energy comes with its own environmental challenges regarding land use, water consumption, emissions, and the use of hazardous materials. Let’s “shine a light” on those environmental impacts, and determine if the good outweighs the bad when it comes to solar energy and the environment. The land use implications for solar energy projects depend on their scale. Small rooftop arrays are not a significant concern. Larger scale projects, however, can take up a lot of real estate. Unlike wind power projects which can co-exist with agricultural land use, there is little opportunity for a shared use model with large solar installations which can disrupt local flora and fauna. This issue can be mitigated by utilizing low-value locations such as brownfields, abandoned mining sites or along transportation and transmission corridors. Solar PV does not use water in electrical generation, whereas CSP projects do consume water. The actual water usage depends on variables such as plant design, location and the type of cooling system employed. According to UCS, CSP plants using wet-recirculating technology with cooling towers withdraw between 600 and 650 gallons of water per megawatt-hour of electrical production. Dry-cooling technology can cut water usage by 90% but can result in higher costs and lower efficiencies. One potential point of concern is that some of the best places for solar energy happen to have the driest climates and poorest water availability. Therefore, water supply is an important consideration when it comes to solar projects. Several hazardous materials are used during the PV cell manufacturing process. Chemicals are used for the most part to clean and purify the semiconductor surface, including substances such as hydrochloric acid, sulfuric acid, nitric acid, hydrogen fluoride, 1,1,1-trichloroethane, and acetone. Manufacturers must meet legal requirements to make sure that workers are not harmed by exposure to dangerous chemicals, and that such substances are disposed of properly. Thin-film PV cells include toxic substances such as gallium arsenide, copper-indium-gallium-diselenide, and cadmium-telluride. While improper handling or disposal could result in serious environmental concerns, manufacturers are highly motivated to recycle these highly valuable materials rather than to send them to the landfill. To be certain, toxic materials are associated with every type of energy generation. Coal must be cleaned with chemicals and burnt, nuclear energy requires highly radioactive material, and wind turbines utilize metal that must be mined and processed. No energy type is ideal, but clearly, some are better than others, as shown by comparative life cycle emissions discussed in the following section. 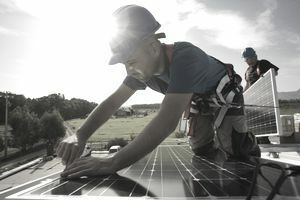 Solar energy earns its stellar reputation as an energy source in that it does not generate greenhouse gases during operations. Global warming emissions are created, though, at other stages of the solar energy life cycle. These stages include resource extraction, manufacturing, transportation, installation, maintenance, decommissioning and dismantling. This initial investment in energy is paid back, however, by 30 years of environmentally friendly energy generation. Fossil fuel generated power, on the other hand, continues to produce greenhouse gas emissions on an ongoing basis. Most estimates show that solar, over its complete lifecycle, produces a lot less carbon dioxide equivalent than natural gas, and dramatically less than coal. According to UCS, PV systems fall between a range of 0.07 and 0.18 pounds of carbon dioxide equivalent per kilowatt-hour, while CSP solar systems generate CO2 equivalent in a range of 0.08 to 0.2 pounds. These figures are dramatically less than the lifecycle emissions for natural gas (0.6-2 lbs of CO2E/kWh) and coal (1.4-3.6 lbs of CO2E/kWh). So while solar power isn’t a perfect solution, it is much more environmentally friendly than producing electricity from non-renewable sources, especially coal. Ultimately, whether or not using solar is a good idea in your community depends on variables such as solar irradiance and other renewable energy sources.